Since the 1970s, the United States has experienced rising wage inequality stemming from a growing wedge between overall productivity (how much workers produce in an hour of work on average), and compensation. In the three decades following World War II, hourly compensation of the vast majority of workers rose in line with productivity. But since the 1970s, pay for the vast majority of workers, including the broad middle class, has lagged further and further behind overall productivity. This has resulted in chronically slow growth in the living standards of middle-income Americans (Bivens et al. 2014). Changes in labor market policies and practices have played an important role in the dynamic of rising inequality and wage stagnation for the vast majority. One example of a change in labor market policy that has eroded the standing of typical workers vis-à-vis their employers and contributed to this dynamic is the right of workers to earn overtime pay premiums for working excessive hours. To ensure the right to a limited workweek, the Fair Labor Standards Act (FLSA) requires that workers covered by FLSA overtime provisions must be paid at least “time-and-a-half,” or 1.5 times their regular pay rate, for each hour of work per week beyond 40 hours. The rule is meant to protect workers who lack control over their time and tasks and do not receive high pay. The rule aims to exclude professional and managerial employees from overtime pay requirements by exempting workers who pass certain “duties tests” or who make over the salary threshold under which all salaried workers, regardless of their work duties, are covered by the overtime provisions. However, this salary threshold has rarely been updated—it has been changed only eight times in 75 years and only once since 1975—nor is it indexed to inflation. The salary threshold for the exemption to the overtime rules of the Fair Labor Standards Act has been allowed to fall to a level—$455 per week—that is currently less than the poverty threshold for a family of four for someone who works year-round. In this issue brief, I discuss another important benchmark which strongly suggests that the proposed threshold of $984 is modest, and that a threshold of $1,122 is more consistent with the 1975 benchmark, even after accounting for the shift toward higher-level white collar professional and managerial jobs that has occurred since that time. In 1975, the share of salaried workers under the salary threshold was 65 percent (note, a salaried worker is a worker who is paid on a regular schedule and receives a guaranteed minimum amount on each pay date regardless of hours worked).2 In other words, in 1975, nearly two-thirds of salaried workers were covered by overtime protections in the Fair Labor Standards Act based on their earnings alone. The real value of the threshold has dropped so dramatically that in 2013, just 11 percent of salaried workers were under the threshold. These results are displayed in Table 1. Note: A salaried worker is a worker who is paid on a regular schedule and receives a guaranteed minimum amount on each pay date regardless of hours worked. Table 1 also shows that if the threshold were raised to $984—the 1975 threshold in inflation-adjusted terms—47 percent of salaried workers would be below the threshold and therefore automatically covered by overtime protections, a much smaller share than was covered in 1975. 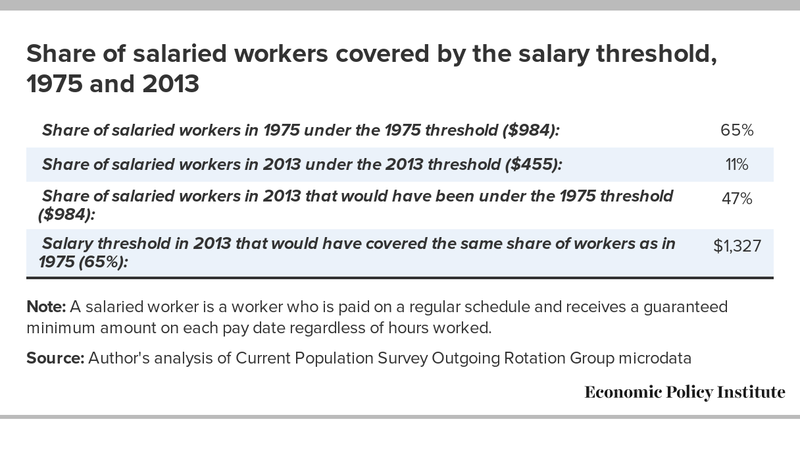 To cover the same share of workers as was covered in 1975, the threshold would have to be $1,327. This suggests that $984 may be far too modest relative to the 1975 benchmark. However, the labor market has changed since 1975, with a larger share of the workforce now in higher-level white-collar professional or managerial roles. This means it is arguably appropriate that the share of workers covered by overtime protections is somewhat lower than in 1975. Since these higher-level jobs require higher levels of education, a reasonable way to “control” for these changes in the labor market is to look at what has happened within educational categories instead of at the workforce as a whole. Another way to see the importance of controlling for changes in the labor market is to note, first, that the share of workers falling under a given salary threshold is lower for workers with higher levels of education, and, second, that the workforce today is significantly more educated now than it was in 1975. (In 1975, 30 percent of salaried workers had a four-year college degree or more, while in 2013, the share with this level of education was 57 percent). Together these facts mean that some of the overall decline in the share covered by overtime protections since 1975 can be explained by the fact that more salaried workers today are in higher-level jobs that require higher levels of education. This underscores the usefulness of accounting for such changes by looking within educational categories instead of at the labor market as a whole. 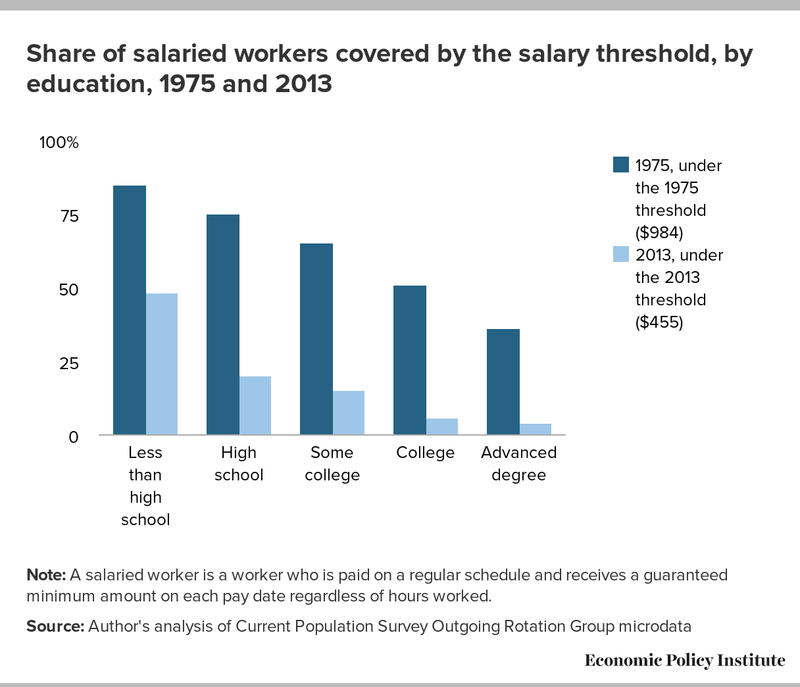 Figure A shows the share of salaried workers under the salary threshold in 1975 and 2013 by education. (These data are also provided in the first two columns of Table 2.) In 2013, for every education category, the share under the salary threshold was much lower than it was in 1975. 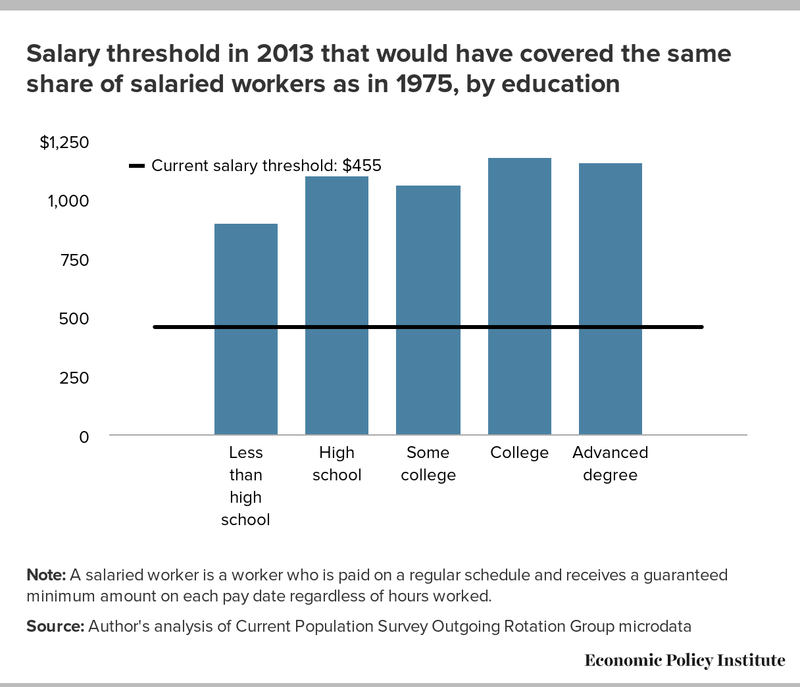 Fifty-one percent of salaried workers with a college degree were covered by the salary threshold in 1975, compared with just six percent in 2013. For salaried workers with an advanced degree, 36 percent fell under the salary threshold in 1975, compared with just 4 percent in 2013. These education breakdowns show that the shift toward higher-level jobs requiring higher levels of education does not come close to fully explaining the post-1975 drop in the share of salaried workers falling under the threshold for automatic access to overtime protections. 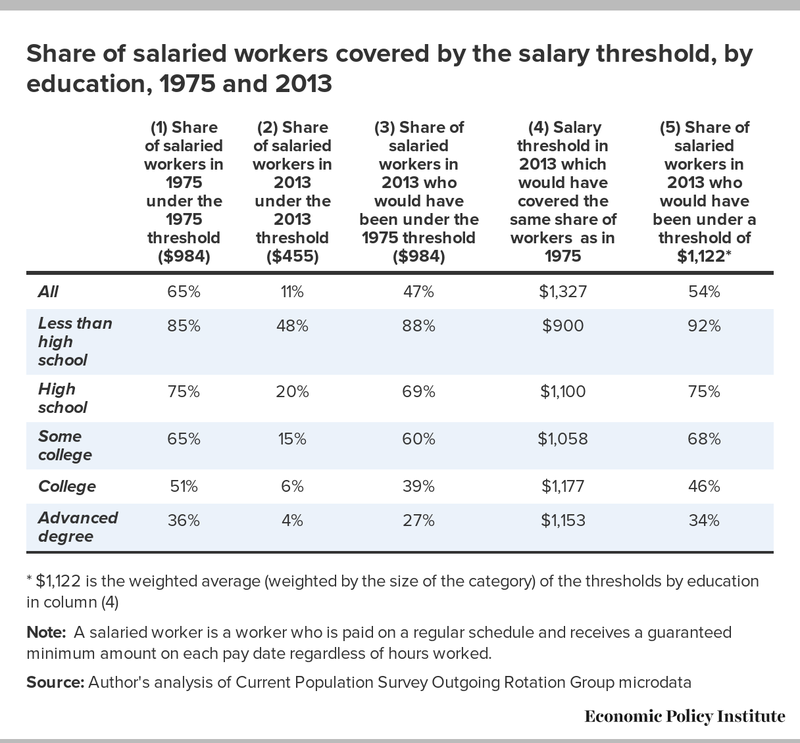 Column (3) of Table 2 shows that if the salary threshold were raised to $984, the share of workers under the threshold in 2013 would be substantially lower than in 1975 within every education category except for those with less than a high school degree, where it would be modestly higher (88 percent compared with 85 percent). It should be noted that this is a small group—in 2013, only 3 percent of salaried workers did not have a high school degree. If the salary threshold were raised to $984, just 39 percent of college-educated workers would fall under the salary threshold, substantially lower than the 1975 share, 51 percent. The share of workers with an advanced degree under the salary threshold would be 27 percent, also substantially lower than the 1975 share, 36 percent. In other words, even after controlling for the shift toward higher-level jobs since 1975 by looking at what would happen within educational categories instead of at the workforce as a whole, $984 is still a very modest threshold. As shown in column (4) of Table 2 and in Figure B, to cover the same share of college-educated workers as was covered in 1975, the threshold would have to be $1,177, and to cover the same share of workers with an advanced degree as was covered in 1975, the threshold would have to be $1,153. A weighted average of the thresholds in Figure B—the thresholds that would cover the same share of workers as were covered in 1975 for each education category—is $1,122. The last column of Table 2 shows the share of salaried workers that would fall under a salary threshold of $1,122 in 2013. Overall, just 54 percent of salaried workers would fall under the threshold, a far smaller share than in 1975 (65 percent), which at first glance suggests that $1,122 is too modest a threshold. However, when looking by education category, the 2013 shares are similar to the 1975 shares, with college-educated and advanced-degreed workers having slightly lower coverage rates and those with less education having the same or slightly higher coverage rates. What these columns show is that $1,122 is the threshold level that is most consistent with the 1975 benchmark, after accounting for the shift toward higher-level jobs that has occurred since that time. The Economic Policy Institute gratefully acknowledges the support it received from the Ford Foundation for this project. U. S. Department of Labor (DOL) Wage and Hour and Public Contracts Divisions. 1949. Report and Recommendations on Proposed Revisions of Regulations, Part 541. 1. The 1949 report referred to by the authors is a report by the U.S. Department of Labor outlining recommended regulatory changes to the Fair Labor Standards Act of 1938. The report (U.S. DOL 1949) led in 1950 to the first major change in FLSA regulations since amending regulations in 1940 (Bernstein and Eisenbrey 2014). 2. In 1975, 45.9 percent of workers were salaried; that dropped slightly to 41.3 percent by 2013.